Owning a bond can be done rather easily nowadays. You can either select individual bonds or investing in mutual fund, exchange traded fund (ETF), and closed-end fund (CEF). If you are not diverse in selecting individual bond, you still have the option to invest in bond. Investing in bond fund or fixed income fund is one of these options. Bond fund can be divided into 2 main groups like taxable bond fund and non taxable bond fund (Muni bond fund). This taxable bond fund can be divided into many different categories and one of these is international bond fund. Investing in international bond fund can provide additional diversification to your investment portfolio. International bond fund may invest its fund assets in variety of countries like developed countries (Europe, Japan, Australia, Canada, Singapore, etc), and developing countries including emerging markets (Brazil, Russia, China, India, etc). Investing in these international bond funds involves investment risk including currency fluctuations, political risk, economic instability, credit risk, high yielding risk, liquifity risk, and more. The following 10 best international bond fund can be your first choice in investing international bond or world bond for 2011. Most of these funds have huge assets, 2 or more stars rating from Morningstar, and well known managers. As any bond fund, these funds also have yield or distribution. Note: Please check for load or fees for details below. 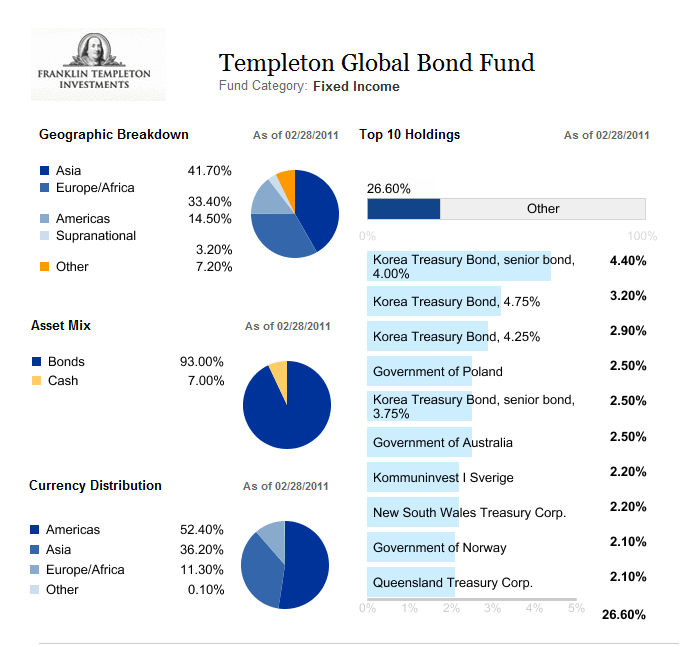 The investment in Templeton Global Bond fund is seeking current income, income growth and capital appreciation. The majority net assets investment of this fund is in bonds including any maturity debt securities (notes, debentures, bonds and bills). The investment in bonds takes the largest part (at least 80%), while the remaining percentage is invested in bonds with top-four rating issuers. The benchmark used is independent rating agencies, such as S&P or Moody Investors Service. The non rated bonds will be considered and rated by the fund lead manager. Michael Hasenstab has been the lead manager since Jan, 2001 even though he has joined this company since 1995. This TPINX fund has 5.31% of distribution rate and 0.91% expense ratio. The 12b1 fee of this fund is 0.25%, with 4.25% front end sales charge fee. If you are interested to invest in this fund, the minimum initial investment is $1,000 for brokerage account or $250 for IRA account. No minimum subsequent investment required. This fund has returned 6.19% over the past one year and 11.29% over the past ten years. This fund has experienced a total of 21 years of up-going performance and 3 years in down performance. The best one year total return is 21.29% (in 2003). The other class tickers of this fund are TGBAX, TEGBX and FGBRX. Among all, TGBAX has the highest yield in the class (5.58%) with 0.66% expense ratio and no fee. 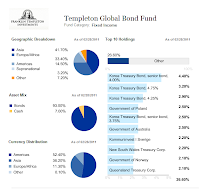 The top ten holdings of this TPINX fund as of Feb 28, 2011 are Korea Treasury Bond-senior bond-4.00% (4.40%), Korea Treasury Bond-4.75% (3.20%), Korea Treasury Bond-4.25% (2.90%), Government of Poland (2.50%), Korea Treasury Bond-senior bond-3.75% (2.50%), Government of Australia (2.50%), Kommuninvest I Sverige (2.20%), New South Wales Treasury Corp (2.20%), Government of Norway (2.10%) and Queensland Treasury Corp. (2.10%). These ten holdings make up to 26.60% of the total 198 holdings. Oppenheimer International Bond investment main objective is to provide total return. It also has the secondary objective which is to provide consistent income. The net assets investment strategy is investing at least 80% in bonds, and selecting at least three countries outside U.S. This OIBAX primary investment is in debt securities of foreign government and corporate issuers. This non-diversified fund has neither market capitalization nor maturity range limitation. The fund manager of this fund is Arthur P. Steinmetz, he also serves as the senior VP of Oppenheimer Funds. This fund is incepted since June 1995 and they have a total of 13 years up performance and 2 years of down performance. The performance of this Oppenheimer Fund is 2.76% over the past three years. With the total net assets of 12.98 billion, this fund distributed 4.12% yield. The expense ratio of this fund is 0.98% annually, quite low compared to the average of 1.14%. The minimum balance to invest in this fund is $1,000 for brokerage account and $500 for IRA account. The brokerage account required a minimum of $50 for the subsequent investment. The other class tickers of this fund are OIBBX, OIBCX, OIBNX and OIBYX. Except for OIBYX, the minimum investment for the other class is the same ($1,000). The top issuers for this fund as of Feb 28, 2011 are Government of Japan (22.4%), Federal Republic of Brazil (5.2%), Republic of Turkey (4.5%), Republic of Germany (4.5%), Republic of Italyy (3.9%), Institutional Money Market Fund (3.7%), United Mexican States/ Mexico (3.7%), Republic of Poland (3.1%), United Kingdom Treasury (3.0%) and Republic of South Africa (3.0%). And the top regions as per the investor assets percentage are Japan (22.4%), Latin America (19.9%), Europe (18.9%), Emerging Europe (13.9%), Asia, ex-Japan (11.9%), United States/Canada (8.5%) and Middle East/Africa (4.4%). Providing a high level of total return is the main objective of American Funds Capital World Bond investment. With the majority net assets investment in bonds, this fund may also invests in outside U.S issued securities. The main investment is in debt securities of governmental, supranational and corporate issuers denominated in various currencies, including U.S. dollars. Although this fund preferred to invest in investment-grade bonds but it may also invest up to 25% of assets in lower quality debts. This world bond mutual fund is managed by James R. Mulally since Aug 1987. The yield of this fund is 3.96% per year. The last dividend distributed in March 22, 2011 is 0.18%. This CWBFX fund has the lowest expense ratio of all the funds in this list (0.88%). There is a 0.24% 12b1 fee and a 3.75% of front-end sales load. The adjusted return of this fund over the past three years is 3.03% and 5.45% over the past five years. The minimum to invest in this fund for either brokerage or IRA account is $250. This fund can be purchased from 71 brokerages include TD Ameritrade Institutional Services, Scottrade Load, JPMorgan, Merrill Lynch, Vanguard, Edward Jones and Schwab Retail. The other class tickers of this fund are CCWFX, CWBCX, WBFFX, BFWFX, RCWEX, RCWFX and RCWGX. Some asset classes of fund have lower expense ratio fee, and no front end sales charge fee. The portfolio percentage of the assets investment as of December 31, 2010 is Agency Notes & Bonds (0.3%), Cash & Equivalents (5.5%), Mortgage- and Asset-Backed Securities (9.5%), Municipal Securities (0.4%), Non-U.S. Corporate Bonds (13.5%), Non-U.S. Governments/Agencies (50.7%), Other (0.3%), U.S. Corporate Bonds (10.7%) and U.S. Treasury Securities (9.1%). 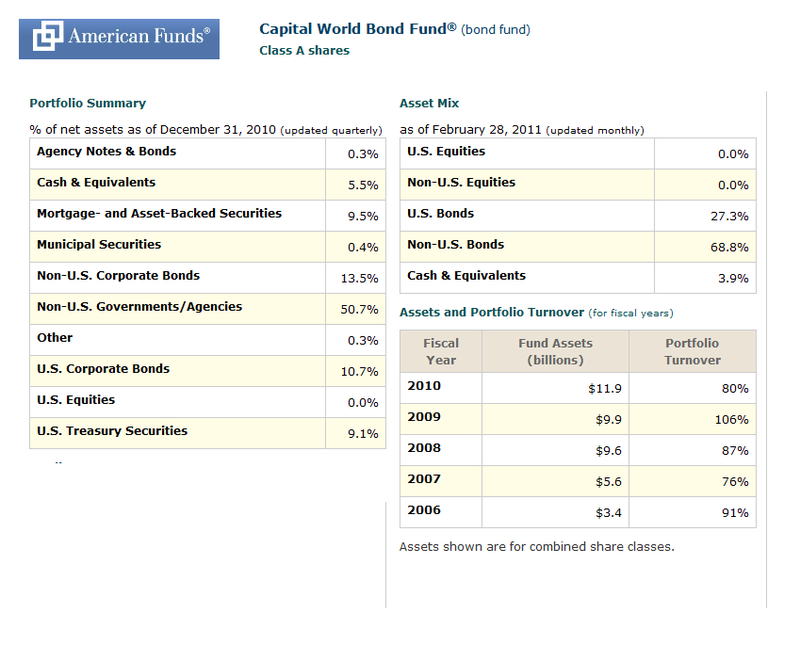 And as of Feb 28, 2011, the largest investment of this fund is in Non-U.S. Bonds (68.8%) and U.S. Bonds (27.3%). The geographic breakdown as of December 31, 2010 is United States (27.1%), Europe (39.7%), Asia & Pacific Basin (17.2%), Other (Including Canada & Latin America) (10.5%) and Cash & Equivalents (5.5%). This PIMCO Foreign Fund (USD-Hedged) is looking for maximum real return. The major net assets investment of this fund is in Fixed-Income Instruments that are connected economically to foreign countries, with a minimum of three foreign countries and limit to 20% of the total assets. This PFOAX fund may also invest in derivative instruments, such as futures contracts or swap agreements, options or in mortgage- or asset-backed securities. 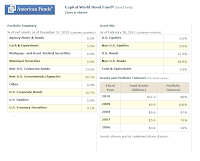 This world bond mutual fund is managed by Scott A. Mather since 2008. It has a distribution rate of 2.09% with a 0.17% year-to-date return. The annual holdings turnover of this fund is quite high (411.00%) compared to the average of 127.8%. If you are interested to invest in this fund, the only option available is brokerage account with the minimum balance of $1,000. The annual expense ratio of this fund is 0.95%. This fund has 0.25% 12b1 fee and 3.75% of front-end sales charge fee. The best 1 year total return was in 2009 (18.48%). This fund has returned 1.75% over the past one year and 5.33% over the past ten years. The other class tickers of this fund are PFRAX, PFOBX, PFOCX, PFODX, PFORX, PFBPX and PFRRX. Among all, PFORX has the highest yield (2.54%) and the lowest expense ratio (0.50%). The top countries for the net assets investment of this taxable bond fund as of Feb 28, 2011 are Japan (41.60%), Europe (31.00%), United Kingdom (12.80%), Germany (12.50%), France (7.10%), Netherlands (1.60%) and Brazil (1.20%). AllianceBernstein Global Bond investment seeks to produce current income consistent with capital preservation. The main investment of net assets of this fund is in fixed-income securities, with the 75% of total amount in investment grade rated and 25% in below investment grade. This ANAGX fund may also invest in a broad range of fixed-income securities with short- to long-term maturity denominated in local currency or U.S. Dollar. This international bond mutual fund is managed by Paul DeNoon since 2002, known as Mr. Peebles. He is as well the CIO of AllianceBernstein Fixed Income. This fund belongs to the family of AllianceBernstein. With the total net assets of 2.91 billion, this fund has the 3.67% yield. The yearly expense ratio of this fund is 0.90%. The year-to-date return is 0.27% (Feb 28, 2011). The performance of this fund is 4.76% over the past three years. Between the 18-years operating, the best 1-year total return is 24.20% in 1996. The minimum balance to invest in this fund either in brokerage or IRA account is $2,500 (same for ANABX and ANACX). There is a 0.30% 12b1 fee applied and 4.25% front-end sales charge fee. The other class tickers of this fund are ANAYX, ANABX, ANACX, ANAIX, ANAKX and ANARX. Among all, ANAIX has the highest distribution rate of 4.01%. ANABX and ANACX have higher 12b1 fee (1.0%). The top ten holdings of this AllianceBern Global Bond Fund are Netherlands Government Bond 4.00% (4.60%), Bundesrepublik Deutschland Series 05 3.50% (4.34%), Canada Housing Trust No 1 3.15% (3.29%), Canadian Government Bond 2.00% (3.18%), United Kingdom Gilt 4.00% (2.82%), Australia Government Bond Series 118 6.50% (2.63%), U.S. Treasury Notes 2.625% (2.51%), Canada Housing Trust No 1 2.95% (2.43%), United Kingdom Gilt 5.00% (2.09%) and U.S. Treasury Notes 1.00% (1.84%). The total country breakdown data is United States (41.40%), United Kingdom (11.63%), Canada (9.60%), Germany (7.66%), Netherlands (6.75%), France (3.39%), Australia (3.29%), Russia (2.60%), South Africa (1.93%) and Brazil (1.59%). 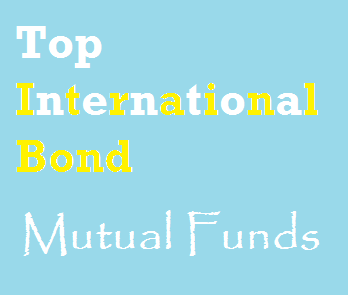 For the next 5 funds in this list, please check Top 10 Best International Bond Funds (Part 2).